This lesson introduces sixth-grade students to the kitchen classroom. Students meet staff, explore the kitchen, learn the basic rules and systems, and practice setting the table to eat a garden snack. Students mark the transition from the garden to the kitchen by harvesting herbs to make herbal tea that they drink with their snack. While eating, they share a food memory. Name and locate the basic tools and equipment in the kitchen. Practice implementing basic kitchen routines. Use descriptive language and sensory details to describe a food memory. 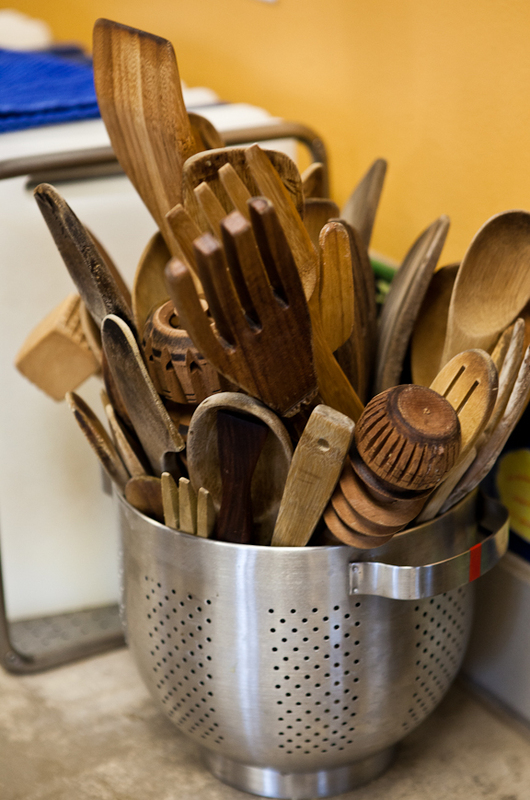 Accurately identify the basic tools and equipment in the kitchen. Set the table, compost food scraps, and correctly utilize the bussing system. Share a personal food memory using descriptive language and sensory details. Welcome students and divide them into three table groups. Table groups are color-coded: green, red, and blue. Students remain in the same table group for the duration of their kitchen rotation. Introduce kitchen staff, volunteers, and all facilitators of the lesson. Have a student volunteer from each table group choose a question from the question cards to ask each staff member as they introduce themselves. Describe what students can expect in the kitchen – cooking and eating together! Discuss the behavior expectations in the kitchen. Emphasize that the 4B's (Be Safe, Be Respectful, Be Responsible, and Be an Ally) for the kitchen are the same as in the garden and their academic classrooms. Introduce students to the kitchen's infrastructure and systems. While on the tour, prompt students to reflect on whether each system is a "kitchen-only" system (e.g. laundry, dishes) or a "kitchen-garden" system (e.g. compost, graywater). Bring students outside to the herb garden. Have every student pick two leaves to bring inside, wash, and add to a teapot for herbal tea. Return to table groups and give students time to explore their cooking stations and toolboxes. While at the cooking stations, challenge students to find one tool or item that everyone recognizes, and one tool or item that no one in the group is familiar with. While exploring the toolboxes, ask students to report on their findings using the "I notice, I wonder, It reminds me of" sentence frame. Introduce the reflection cards. Quiz the group after exploration time to help them recall the names, uses, and locations of basic tools, ingredients, and equipment. Explain to students that they are responsible for cleaning and maintaining the tables, the toolboxes, and the cooking stations. Introduce students to the kitchen's rituals and routines. Describe to students the items needed to set the table (tablecloth, centerpiece, tea cups, napkins, water, and cups). While students are setting the table, fill the teapot with boiling water and allow the tea to steep. While eating, encourage students to share a food memory, or use the question cards to engage the full group in shared conversation. Flicker lights. Explain this is a way we get everyone’s attention. Announce that now it is time to transition into bussing dishes. Have students familiarize themselves with the kitchen systems by composting, bussing dishes, and refilling water pitchers. Students share food memories and have an opportunity to ask questions. Invite students to share their food memories. Invite students to share something they still wonder about the kitchen. Introducing the teachers: We use the question cards to introduce ourselves to the students because it models showing up in a genuine way. We find students are often quite captivated by teachers' responses to challenging questions. The 4B's: We introduce the 4B’s with short skits. First, we demonstrate what not to do and ask students to give a thumbs-up or thumbs-down—are we following the 4B’s? We call on students with raised hands to give corrections and then do the demonstration again with correct behavior or practices. Labeling: Label kitchen equipment and supplies that students need to know the names of. Collaboration with academic teachers: Academic teachers complete the food memory activity with their students before their first kitchen lesson so that students are prepared to share a memory at the table. Sharing food memories: Sharing a food memory can be a vulnerable experience for some students. Throughout this lesson, and especially while students are sharing their food memories, teachers are mindful and explicit in facilitating a respectful, safe environment for all students to engage with the group. Identify measuring tools from the ESY Toolbox and follow instructions to use and care for them.